The original version of An Affair To Remember about a shipboard romance whose continuance on shore is interrupted by an unforeseen mishap. Two people, each engaged to someone else, meet aboard a ship and instantly fall in love. To test their true love for each other they make arrangements to meet again in six months, but heart-breaking complications occur altering their plans. Nominated for Best Picture; Best Actress-Irene Dunne; Best Supporting Actress-Maria Ouspenskaya; Best Original Story; Best Art Direction; Best Song-"Wishing." Back in this site’s early years, I engaged in a bizarre quest to watch all ten of the 1939 Best Picture nominees on DVD. When this began, a few of the titles weren’t out on DVD, and by the time they appeared, I didn’t care anymore. C’est la vie! A DVD reissue leads me to revisit movie six in that aborted series: 1939’s Love Affair. This flick has been remade a number of times. 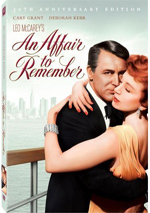 The first reappearance retitled it An Affair to Remember and starred Cary Grant and Deborah Kerr in 1957. 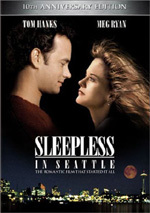 1993's Sleepless in Seattle didn't directly remake the film, but it certainly drew strongly on it, while 1994's Love Affair was a more blatant retelling. Popular consensus seems to feel that An Affair to Remember is the most memorable of that stable, although it didn't receive the same Academy Awards recognition accorded to its predecessor. Love Affair actively dissatisfies me. The vast majority of the film comes across as illogical. In most romances, the principles try hard to come together, but here it seems like they attempt to find as many ways as possible to stay apart. The entire vehicle feels amazingly contrived, as though the filmmakers worked as hard as they could to keep the two lovers separate until their inevitable romantic conclusion. It didn't work for me. Most of their reasons for avoiding each other made virtually no sense, and the whole plot grew incredibly tiresome before too long. Early scenes in which we see Terry McKay (Irene Dunne) and Michel Marnet (Charles Boyer) fall in love during a cruise are reasonably compelling and sweet, but once they separate, it all goes downhill from there. I won’t discuss the plot twists and turns that occur after that point - in case you want to see it and be surprised - but I find them to be unconvincing and usually overly sentimental/saccharine. Boyer and Dunne are perfectly competent in their roles, but the silliness of the story renders that point moot. By the end of the film, I could not have cared less if the two reunited. I was completely bored with their inanities by that point. Actually, only one part of this movie really amuses me, but it isn't something the filmmakers intended to be funny. Terry teaches a kid's choir, and at one point she asks one of the little boys - Aloysious, who will forever be anonymous since the credits don't list the actor's name - to act as a "pitch pipe" and sing an "A" note. The kid tucks his head down to concentrate, pauses, and then lifts his head and opens his mouth wide to "sing" his perfect "A". I put quotes around "sing" because it's obvious the kid's vocals were dubbed, which makes the scene even funnier. The whole bit reprises a minute or so later. It ain't much, but it’s the most entertaining part of the film. Without little Aloysious and his poorly dubbed vocals, the movie would be almost entirely a bore due to the contrived plot and the sickly sentimental and overbearing tone. 1939's Love Affair is an affair to forget. Love Affair appears in an aspect ratio of approximately 1.33:1 on this single-sided, double-layered DVD; due to those dimensions, the image has not been enhanced for 16X9 televisions. Was this the worst transfer I’ve ever seen? I can’t say it was, but I can’t say it wasn’t, either. Everything looked awful. Sharpness was completely atrocious; this was probably the softest picture I've ever seen. At no point did the image look better than "almost okay", which it achieved during a few close-ups; otherwise, it was very hazy and fuzzy. At least the softness meant I saw no moiré effects or jagged edges, but edge haloes remained apparent. The print itself was in pretty bad shape. For roughly the first 15 minutes of the film, it actually didn’t look all that terrible - or maybe it did, but I was so whacked out about the softness that I wasn't able to scan for flaws just yet. In any case, most of the film suffered from defects, and often pretty bad ones, too. Scratches, speckles, grain, various markings and other problems so unusual that I don't even know how to describe them all greet the happy viewer of this DVD. Strange electronic interference occurred at times. I believe that occurred because there's an excellent chance this DVD was mastered from a VHS tape - and a bad one at that! The DVD packed an abundance of flaws. The geniuses behind this disaster also thought it was a great idea to constantly remind us what label released it. This meant a watermark that read “Hollywood Select Video” remained a constant intrusion in the film’s lower right-hand corner. I’m sure this wasn’t the first DVD to do this, but I can’t remember ever seeing it elsewhere. Who thought it made sense to mar the presentation even more with intrusive text? Contrast levels were terrible - the entire movie looked faded and washed-out - and black levels seemed poor as well. Blacks never really seemed black; instead, they were a mushy gray. Shadow detail was a non-issue because of the elevated light levels; I had no problem making out nuances in dark scenes because there were virtually no dark scenes - even those that should have been in low light were fairly bright. Some weird blooming affected contrast and made occasional scenes absurdly bright. Chalk this one up as a total visual disaster. The monaural audio of Love Affair failed as well. For one, volume levels were awfully inconsistent. The movie’s first 33 minutes or so came at a very low level; I had to turn up my receiver’s volume much higher than normal. Matters became more normal from 33 minutes to 51 minutes, and then the volume got another jump and became louder than usual. It was crazy, as the track was so awful it couldn’t even manage to maintain consistency of loudness. At any of the volume levels, the sound was simply atrocious. All I ask of a 70-plus-year-old mono mix is for it to provide decently intelligible audio, but that didn't happen here. The dialogue consistently sounded edgy and distorted. As a result, I had a devil of a time understanding what the characters said. Unfortunately, no subtitles were included, so I couldn't rely on those to help. Dialogue wasn't the only part of the soundtrack to suffer; both music and effects also seemed badly distorted. Hiss and background noise occurred during the film; these were present at all times, but they became more obvious as the volume level increased. I also heard some strange audio effects. Throughout the film, I discerned what sounded like backwards tape loops vaguely emanating from the background. (I played the movie backwards; they're saying, "I buried Paul... Muni".) From start to finish, this was an awful, essentially unlistenable track. Depending on your point of view, Love Affair either comes devoid of extras or packed full of goodies. 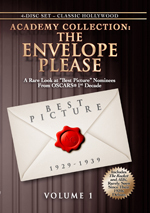 It appears as part of an eight-movie set called Academy Collection: The Envelope Please, Volume 1. This packages Affair with seven other older Best Picture nominated flicks. If you consider those other seven movies to be “extras”, then this is a stuffed release. Otherwise, it only includes trailers for other 1930s BP nominated films: All Quiet on the Western Front, Grand Hotel, The Champ, It Happened One Night, Captain Blood, The Informer, Top Hat, San Francisco, and A Tale of Two Cities. Love Affair has received a handful of home video releases, but I don’t believe any of them have been worthwhile. I reviewed a 1998 DVD that was no better than this one – and possibly worse. Which is too bad. No, I don’t like the film, as it seems sticky sweet/sentimental and really leaves me cold. Nonetheless, the movie maintains appeal to a lot of people and has some historical merit, so it deserves better treatment than it’s received, as the DVD is a total failure. It provides completely awful picture and audio, and it lacks extras related to the movie. Love Affair fans will have to continue to wait for a high-quality home video of the film, as this one turns into an utter disaster. Note that this version of Love Affair appears only as part of “Academy Collection: The Envelope Please, Volume 1”. The four-disc set also includes 1928’s The Racket, 1929’s Alibi, 1931’s The Front Page, 1932’s A Farewell to Arms, 1933’s The Private Life of Henry VIII, 1937’s A Star Is Born and 1938’s Pygmalion.